Indiana State University students seeking the vital products and materials necessary to construct a building begin and end their quest in the same resource area in a design studio on the edge of campus. 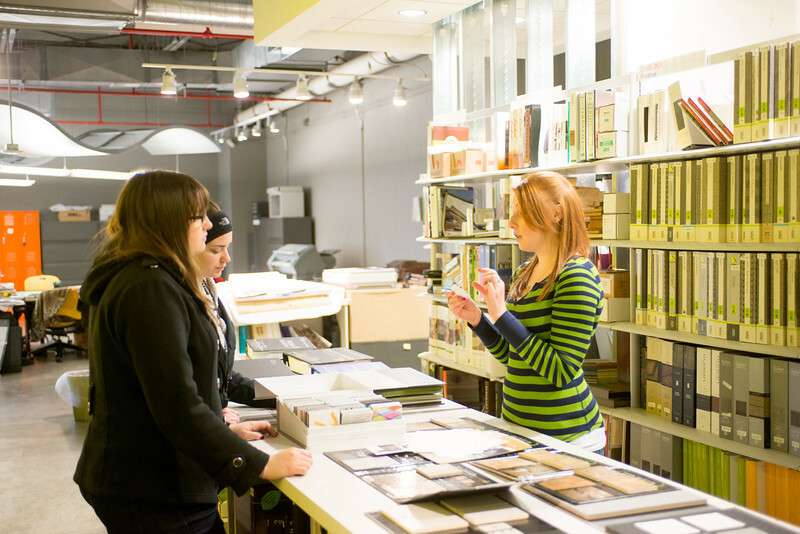 Interior design students routinely work in the program's resource library, which features products and volumes of samples ranging from lighting to wall tiles to carpeting and wood flooring. The students utilize the library for studio projects, learning about real-life companies and products available to be used in future efforts that they will be engaged in as interior designers. "We all use it for our personal projects that we work on," said Taylor Nelson, a junior from Marshall, Ill., who is the resource library manager. "Other students will come to me and ask questions if I know any reps or companies that are known to work well with us, or if I have any suggestions for good products." Students design plans for many different kinds of projects, ranging from renovations to new buildings that are constructed using environmentally-friendly processes and materials. Many companies work with the interior design program, with sales representatives routinely visiting the resource library and Nelson to provide samples of green products that are available so students can use them when designing projects. "It familiarizes all the students with these specific companies that are out there and what we will be using in the future once we get our degrees," Nelson said. "It helps when I meet with reps. They will know that students are familiarizing themselves with their products, and so we will be more likely to contact them for future projects." Nelson routinely schedules meetings with company representatives, with several providing updated sample binders twice a year to show the latest that they have to offer. She then meets with students looking to utilize the items in the interior design resource library. "The purpose behind it is so that the students can use the resource library as though they were out in the field working," said Mary Sterling, associate professor in the built environment department, which includes the interior design program. "All the samples, including catalogs and specification documents, are current." Industry representatives are more than willing to meet with Nelson to share the latest products and services their companies have to offer, as it benefits the companies in the long-term, Sterling said. "They regard us as being in the industry," she added. "They know that they are going to meet up with our students, and the better educated our students are, the more familiar our students are with their products, materials and processes, the more likely they are to do business with them in the future. It's a great cycle." Architectural and design firms typically have their own libraries featuring products and items that they use on projects. The resource library at Indiana State allows students to gain experience in navigating such a center before entering the working world. It also helps provide students with more experience in judging samples and comparing and contrasting them based on a variety of characteristics, such as finishes, costs, installation processes and maintenance procedures, Sterling said. Such comparisons are not possible when students solely research items on the Internet, but are not able to evaluate all aspects of a work sample, such as the durability and safety factor of a particular material, she added. Some of the updated products in the resource library include items that reflect developments in Leadership in Energy and Environmental Design (LEED) certification. LEED certification is a voluntary process by which a third party confirms "green buildings," according to the U.S. Green Building Council. Professors in Indiana State's interior design program have started to follow suit, by providing students with checklists with instructions needed for the different levels of LEED certification. "All of us automatically go for the greenest products that we can have, but since we are still learning, it is difficult for us to keep our products as green as possible and keep checking a checklist," Nelson said. "We're doing our best to familiarize ourselves with everything right now." Bradford Sims, dean of the College of Technology at Indiana State, said the interior design program provides students with great hands-on learning opportunities through hard work in multiple studios that directly influence their success as professionals. "The interior design resource library is a great example of collaboration with industry representatives who understand they can gain future business by providing our current students with knowledge of the products and services they can offer to future clients," Sims said. "A great level of commitment is shown on both sides. It's great for the industry, our university and our students." Photo: http://isuphoto.smugmug.com/Other/Media-Services/IAD-Library-Taylor-Nelson/i-TNNvCLL/0/L/03_06_13_taylor_nelson-0251-L.jpg (ISU/Tony Campbell)Indiana State University junior Taylor Nelson meets with several other students in the interior design resource library at Indiana State. Nelson, who is the library manager, regularly meets with students to provide insights about different materials that students can use on design projects. Photo: http://isuphoto.smugmug.com/Other/Media-Services/IAD-Library-Taylor-Nelson/i-6MQ3JrP/0/L/03_06_13_taylor_nelson-0187-L.jpg (ISU/Tony Campbell)Indiana State University junior Taylor Nelson meets with several other students in the interior design resource library at Indiana State. Nelson, the resource library manager, will also meet with sales representatives from different companies that provide their product catalogs and samples to ensure that the resource library is kept updated on the companies' latest products. 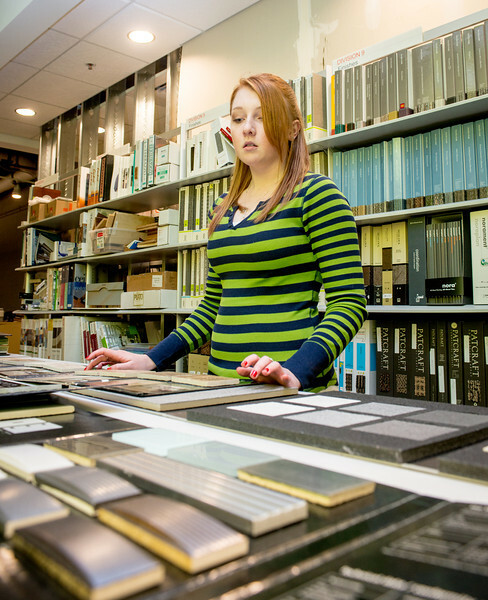 Interior design students routinely work in the program's resource library, which features products and volumes of samples ranging from lighting to wall tiles to carpeting and wood flooring.